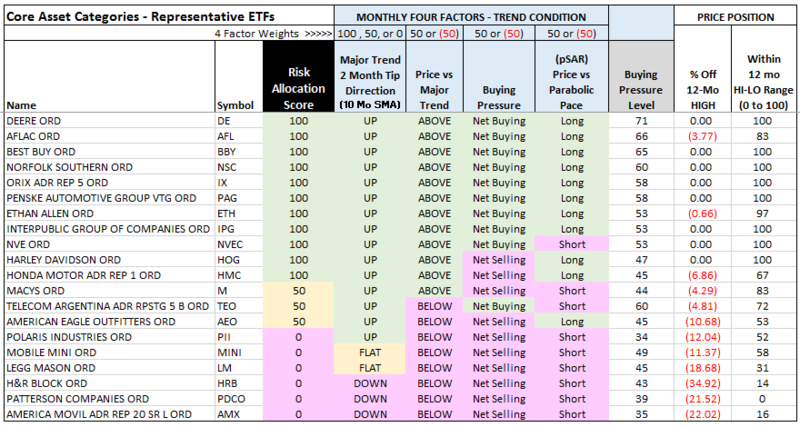 34 of those 100 S&P 500 stocks are in current up trends. 12-mo trailing shareholder yield (dividend yield + buyback yield) is no less than dividend yield (no share issuance). There are companies with tax rates much higher than the nominal rates. Those cases are too complicated for this simple search, and that is why we limited the effective tax range to less than 36%. The 30% minimum is to find those with a substantial potential benefit from a corporate tax rate reduction. PAG Penske Automotive Group, Inc. 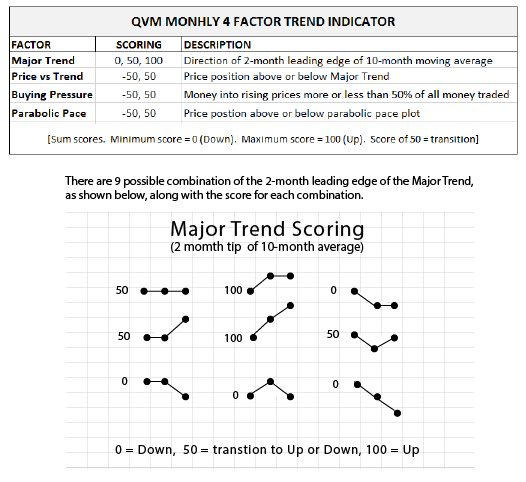 This table presents the trend condition of those 22 stocks, using the QVM 4 Factor monthly trend indicator. A rating of 100 is for the leading end of the major trend line moving up. A rating of zero is for the leading end of the major trend moving down. 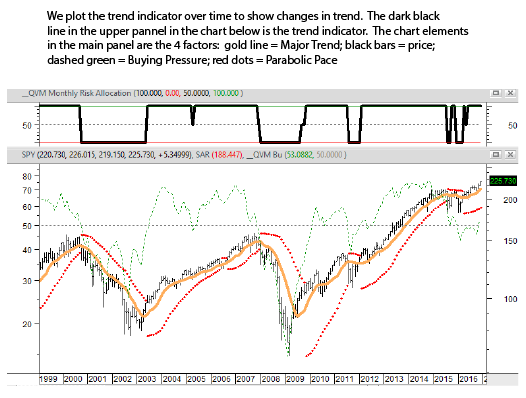 A rating of 50 is for the leading end of the major trend line in transition between trend directions. 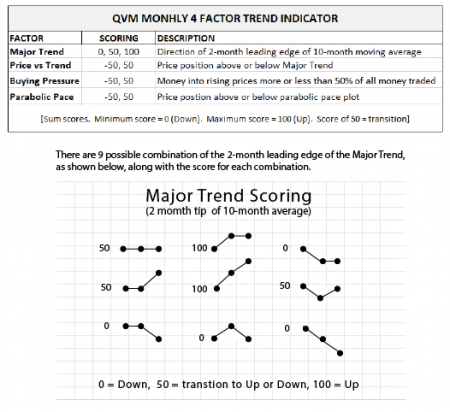 At the bottom of this article, there is an explanation of how the QVM 4 Factor indicator works. The median tax rate among S&P 500 stocks that have positive 7-year cumulative tax rates is 30%, and the average is 24%. 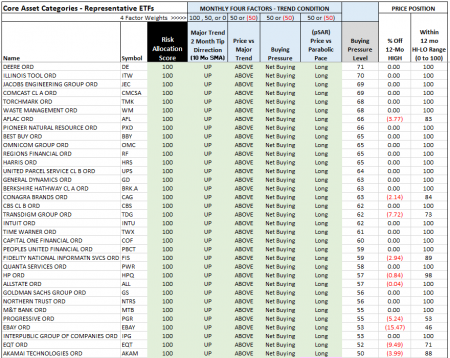 Companies currently with effective tax rates below the 20% rate that is often mentioned in Washington for the next Congress, may find their effective tax rate rising and profits declining, if the “tax loopholes” they have relied upon are repealed to pay for a new lower corporate tax rate. Companies with rather full effective tax rates (such as those in between 30% and 35%) in our filter, would likely find their effective tax rate dropping and profits increasing under a new lower corporate tax rate. Currently low effective tax rate companies with high valuation multiples would possibly see the double effect of declining profits and declining valuation multiples. Currently high effective tax rate companies with high valuation multiples may see support for their multiples as their profits increase as their taxes decline. If a company with a current 35% tax rate (with a 65% after-tax income rate) goes to a 20% tax rate (with an 80% after-tax income rate), that would be a 23% increase in profits. That profits increase could offset a similar decline in valuation multiple, that might be triggered by a general multiple contraction in the broad market. All-in-all that suggests to us that overweighting stocks of companies that would most strongly benefit by a corporate tax rate reduction, and a underweighting stocks whos effective tax rates might increase as a result changes in the tax law is a reasonable idea. Within these two lists, there should be good hunting ground for strong Trump tax plan beneficiaries, that may be suitable for you. A quick summary is in the graphics below. A more expanded discussion is at this link.